Hopefully everyone has recovered from thier Halloween fun and festivities! Rather than do the trick or treat thing Jesse wanted to go to Gattiland for a pizza buffet and to ay all the great arcade games. He did well, enough tickets to land a set of foam (thank goodness!!) Nunchucks...lol. He's determined to become a pro! I cringe at the thought of how black and blue he'd be by now if they weren't foam! Boys!! Our first sketch is up and ready for yall at Sketches In Thyme Project Life Style! I'm super excited and hope you are as well. Be sure to check the blog every day to see a different Mavens take on the awesome sketch by Shawn Lahr! Since thi is a new challenge blog here are a few things you need to know when playing along! 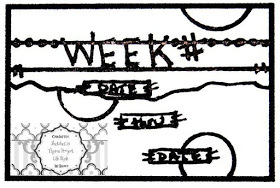 We have 4 weekly Sketches to play along with.....that's four chances to enter, and four chances to win!! You have til the end of the month to link up any of our sketches. Please remember Iif you play along give us a link back on your blogs or photo galleries. And this month the prize that will go to one randomly drawn participant is this awesome Instalife Day To Day roller stamp. 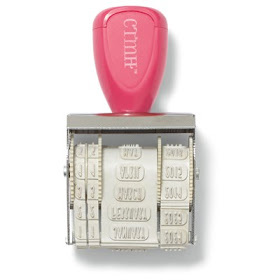 PERFECT for stamping on those PL layouts! Have a go at the sketch and link r up!